This chemistry dictionary offers the chemistry definitions starting with the letter S. These glossary terms are commonly used in chemistry and chemical engineering. Click the letter below to find the terms and definitions beginning with that letter. s orbital – An s orbital corresponds to an electron orbital with angular momentum quantum number l = 0.
sal ammoniac – Sal ammoniac is a deprecated chemistry term for the compound ammonium chloride, NH4Cl. salifiable – Salifiable refers to a substance capable of reacting with an acid to form a salt. Salifiable substances are bases. salifiable earths – Salifiable earths are metal oxides that react with acid to form a salt. Examples: Lime, alumina, and silica are salifiable earths. salt – Salt can mean simply ‘table salt’ or sodium chloride. In chemistry, salt refers to any ionic compound formed when reacting an acid with a base. Examples: NaCl, KCl, CuSO4 are all salts. salt bridge – A salt bridge is a connection containing a weak electrolyte between the oxidation and reduction half-cells in a galvanic cell. salt of tartar – Salt of tartar is a deprecated chemistry term for the compound potassium carbonate, K2CO3. saltpeter – Saltpeter is the common name for the compound potassium nitrate, KNO3. The compounds sodium nitrate (NaNO3), calcium nitrate (Ca(NO3)2), and magnesium nitrate (Mg(NO3)2) is also referred to as saltpeter. samarium – Samarium is the name of the lanthanide element with atomic number 62 and represented by the symbol Sm. saponification – Saponification is a process by which triglycerides are reacted with sodium or potassium hydroxide to produce glycerol and a fatty acid salt, called ‘soap’. Lipids that contain fatty acid ester linkages can undergo hydrolysis. This reaction is catalyzed by a strong acid or base. Saponification is the alkaline hydrolysis of the fatty acid esters. saturated -Saturated can have several meanings in chemistry. Saturated can mean thoroughly soaked with as much water or solvent as possible. A saturated compound is one in which the atoms are linked by single bonds. A fully saturated compound contains no double or triple bonds. A saturated solution is a solution where no more solute can be dissolved in the solution. The solution is at the maximum concentration for the current temperature and pressure. saturated fat – A saturated fat is any lipid (fat) which contains no carbon-carbon double bonds. In other words, a saturated fat has been fully saturated with hydrogen atoms. Saturated fats tend to be greasy or waxy solids. Natural saturated fats often come from animal sources. 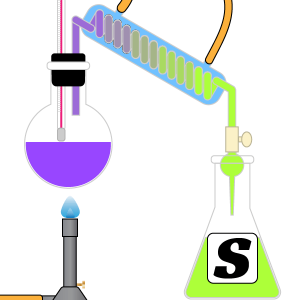 saturated solution – A saturated solution is a solution containing the maximum concentration of a solute. Any additional solute will not dissolve in a saturated solution. scalar – A scalar is a simple physical quantity that can be described by a single number with a unit. A scalar is unchanged by rotating or translating its coordinate system. Examples: Time, temperature, mass, and density are all examples of scalar quantities. scandium – Scandium is the name for the transition metal element with atomic number 21 and is represented by the symbol Sc. It is a member of the transition metals group. science – There are multiple definitions for science. In all cases, science is used as a noun. Science is the systematic study of the natural world, involving the application of the scientific method. Knowledge is obtained via observation, formulation, and testing of a hypothesis, description, experimentation, and theoretical description of phenomena. Any specific area of study of the behavior and structure of the natural world (e.g., physical science, geology, chemistry). A body of knowledge obtained through experience or experimentation. scientific law – A scientific law is a generalized rule to explain a body of observations in the form of a verbal or mathematical statement. Scientific laws imply a cause and effect between the observed elements and must always apply under the same conditions. Scientific laws do not try to explain the ‘why’ the observed event happens, but only that the event actually occurs the same way over and over. scientific method – The scientific method is a system of acquiring knowledge through observation and the experimental testing of hypotheses. The scientific method is based on obtaining and analyzing empirical evidence to support the reasoning process. seaborgium – Seaborgium is the name used for the transition metal element with atomic number 108 and represented by the symbol Sg. second – The second is the SI unit of time. One second is defined as the amount of time required for 9,192,631,770 periods of the wavelength of light associated with the transition between the two hyperfine levels of the ground state of the cesium-133 atom. secondary alcohol – Secondary alcohol is a shorthand notation denoting there are two carbon atoms bonded to the carbon bonded to the hydroxyl functional group in an alcohol. Secondary alcohol carbons are secondary carbons. Secondary alcohols are denoted by 2° alcohol. secondary amide – A secondary amide is an amine with two carbon atoms bonded to the amide nitrogen atom. Secondary amides are often denoted by the shorthand notation of 2° amide. secondary amine – A secondary amine is an amine with two carbon atoms bonded to the amine nitrogen. Secondary amines are often denoted by the shorthand notation 2° amine. Dimethylamine is an example of a secondary amine. secondary carbon – A secondary carbon refers to a carbon atom in a molecule or moiety bonded to two other carbon atoms. Secondary carbon is often expressed in shorthand notation as 2° carbon. secondary radiation – Secondary radiation is radiation produced by the absorption of radiation in matter. Example: Fluorescence is a type of secondary radiation. second quantum number – The second quantum number, ℓ, is the quantum number associated with the angular momentum of an atomic electron. The second quantum number determines the shape of the electron’s orbital. Example: A p orbital is associated with a second quantum number equal to 1.
selenium – Selenium is the name for the nonmetal element with atomic number 34 and is represented by the symbol Se. semi-metal – Semi-metal refers to a group of elements with has properties between metals and nonmetals. There are seven semi-metal elements: boron, silicon, germanium, arsenic, antimony, tellurium, and polonium. semipermeable membrane – A semipermeable membrane is a barrier that allows only certain molecules or ions to pass through while blocking others. sequestrant – A sequestrant is a stabilizer that forms chelates around metal ions to prevent oxidation of fats. ser – Ser is an abbreviation for the amino acid serine. Serine is also abbreviated as S.
short-term exposure limit – Short-term exposure limit refers to the upper limit of the concentration of a substance a person can be continuously exposed to over a short amount of time without causing tissue damage or other adverse health effects. SI – SI is the abbreviation for System Internationale. SI is the name given to the standard metric system of units. side chain – A side chain is the chain of atoms attached to the side of a core chain or backbone of a molecule. Example: Isopentane has a methyl side chain off the second carbon atom of the core butane chain. sievert – Sievert is the SI unit of absorbed dose equivalent of radiation in biological tissue. Sievert measurements depend on the type of radiation, the type of tissue exposed and the amount of radiation absorbed by the tissue. sigma bond – Sigma bonds are covalent bonds formed by direct overlapping between two adjacent atom’s outermost orbitals. The single electrons from each atom’s orbital combine to form an electron pair creating the sigma bond. Sigma bonds are generally denoted by the Greek letter σ.
silica – Silica is the common name for the compound silicon dioxide, SiO2. silicate – A silicate is a class of compounds that contain silicon in the anion. Silicon and oxygen are two of the most common materials in the Earth’s crust. They combine to form silicates that make up the majority of minerals found on Earth such as quartz, feldspar and several gemstones. silicon – Silicon is the name for the metalloid element with atomic number 14 and represented by the symbol Si. silver – Silver is the name of the transition metal element with atomic number 47 and represented by the symbol Ag. simple diffusion – Simple diffusion is a process where a substance passes through a cell membrane without the aid of a carrier molecule. Example: Carbon dioxide and oxygen can pass through cell membranes by simple diffusion. simple protein – A simple protein is a protein that produces only amino acids from hydrolysis. simplest formula – The simplest formula of a compound is a formula that shows the ratio of elements present in the compound. The ratios are denoted by subscripts next to the element symbols. Example: Glucose has a molecular formula of C6H12O6. It contains 2 moles of hydrogen for every mole of carbon and oxygen. The simplest (or empirical) formula for glucose is CH2O. single bond – A single bond is a chemical link between two atoms in which electrons are shared between them. Example: There is a single bond between the oxygen and each hydrogen in a water molecule (H2O). Each of the covalent bonds contains two electrons – one from a hydrogen atom and one from the oxygen atom. Both atoms share the electrons. is a single displacement reaction. skeletal structure – A skeletal structure is a graphical representation of the arrangement of atoms and bonds in a molecule. Skeletal structures are shown in two dimensions where element symbols are used for the atoms and solid lines to represent bonds between them. Multiple bonds are represented by multiple solid lines. Double bonds are shown with two lines and triple bonds are shown with three lines. Carbon atoms are implied when two bonds meet and no atom is listed. Hydrogen atoms are implied when the number of bonds is less than four on a carbon atom. Hydrogen atoms are shown if they are not bonded to a carbon atom. 3-D arrangements are represented by solid and hashed wedges. Solid wedges imply bonds coming towards the viewer and hashed wedges are bonds pointing away from the viewer. smectic – Smectic refers to a substance where the molecules that make up the substance are parallel to each other and arranged in layers, rows or both. Smectic phase refers to liquid crystals where the crystals in an array are aligned with an outside stimulus. smelting – Smelting is a chemical process to isolate an element from its ore using heat and a reduction agent. smog – Smog is a combination of the words smoke and fog. It is a form of air pollution formed from the emissions from combustion reacting with sunlight to produce secondary pollutants. smoke – Smoke is a colloid comprised of solid particles and gases associated with the products of incomplete combustion and air. soap – Soap is a salt of a fatty acid. Commercial soaps are mixtures of fatty acid salts. soda ash – Soda ash is a common name for the compound sodium carbonate (Na2CO3). sodium – Sodium is the name for the alkali metal element with atomic number 11 and is represented by the symbol Na. soft x-rays – Soft x-rays are x-rays with energy less than 5 keV. sol – A sol is a type of colloid in which solid particles are suspended in a liquid. solid – A solid is a state of matter characterized by particles arranged such that their shape and volume are relatively stable. The constituents of a solid tend to be packed together much closer than the particles in a gas or liquid. solidification – Solidification is a phase change of matter that results in the production of a solid. Generally, this occurs when the temperature of a liquid is lowered below its freezing point. solubility – Solubility is the maximum quantity of a substance that may be dissolved in a solvent and produces a saturated solution. solubility product – The solubility product or Ksp, is the equilibrium constant for a chemical reaction in which a solid ionic compound dissolves to yield its ions in solution. solute – The substance that is dissolved in a solution. For solutions of fluids, the solvent is present in greater amount than the solute. solution – A solution is a homogeneous mixture of two or more substances. A solution may exist in any phase. Examples: An example of a solid solution is brass. An example of a liquid solution is aqueous hydrochloric acid (HCl in water). An example of a gaseous solution is air. solvent – The component of a solution that is present in the greatest amount. It is the substance in which the solute is dissolved. sorption – Sorption is the assimilation of molecules of one substance by another material in a different phase. specific gas constant – The specific gas constant is the gas constant divided by the molar mass of a gas. The specific gas constant is denoted by the symbol Rspecific. specific gravity – Specific gravity is the ratio of the density of a substance to the density of water. The specific gravity of pure water at 4 °C is 1. Specific gravity is a unitless value. specific heat – Specific heat is the amount of heat energy required to raise the temperature of a body per unit of mass. In SI units, specific heat (symbol: c) is the amount of heat in joules required to raise 1 gram of a substance 1 Kelvin. Examples: Water has a specific heat of 4.18 J/g·K. Copper has a specific heat of 0.39 J/g·K. specific heat capacity – Specific heat capacity is another way to say specific heat. See specific heat definition above. specific volume – The specific volume is the volume of an object divided by its mass. Specific volume is the reciprocal of the density of an object. specific weight – Weight per unit volume of a material. spectator ion – A spectator ion is an ion that exists in the same form on both the reactant and product sides of a chemical reaction. Example: The reaction between sodium chloride (NaCl) and copper sulfate (CuSO4) in aqueous solution. The sodium ions (Na+) and sulfate ion (SO42-) are the spectator ions in this reaction. They appear unchanged in both the product and reactant side of the equation. These ions just ‘spectate’ while the other ions form the copper chloride. spectroscopy – Spectroscopy is the analysis of the interaction between matter and any portion of the electromagnetic spectrum. Traditionally, spectroscopy involved the visible spectrum of light, but x-ray, gamma, and UV spectroscopy also are valuable analytical techniques. spectrum – The characteristic wavelengths of electromagnetic radiation (or a portion thereof) that is emitted or absorbed by an object or substance, atom, or molecule. spin – In physics and chemistry (quantum mechanics), spin represents an intrinsic property of a particle relating to its angular momentum. spin quantum number (Ms) – The fourth quantum number denoted by ms. The spin quantum number indicates the orientation of the intrinsic angular momentum of an electron in an atom. The only possible values of a spin quantum number are +½ or -½ (sometimes referred to as ‘spin up’ and ‘spin down’). spirit – A spirit is a substance collected from vapors through the process of distillation. spirit of alum – Spirit of alum is a deprecated chemistry term for sulfuric acid (H2SO4). Sulfuric acid was prepared by distilling a solution containing alum (potassium aluminum sulfate). spirit of hartshorn – Spirit of hartshorn is an early chemical name for a strong solution of ammonia (NH3). Spirit of hartshorn was prepared by distilling a solution prepared from the horns of deer. spirit of vitriol – Another deprecated chemistry term for sulfuric acid (H2SO4). See Spirit of alum definition. spontaneous fission – Spontaneous fission is a form of radioactive decay where an atom’s nucleus splits into two smaller nuclei and generally one or more neutrons. Spontaneous fission generally in atoms with atomic numbers above 90. Spontaneous fission is a relatively slow process except for the heaviest isotopes. For example, uranium-238 decays by alpha decay with a half-life on the order of 109 years but also decays by spontaneous fission on the order of 1016 years. Example: Cf-252 undergoes spontaneous fission to produce Xe-140, Ru-108, and 4 neutrons. spontaneous process – A spontaneous process is a process that will occur without any energy input from the surroundings. A process that will occur on its own. stabilizer – A stabilizer is a substance that prevents or inhibits a chemical reaction. A stabilizer is also a substance that inhibits the separation of the components of mixtures. Example: Antioxidants are stabilizers that prevent oxidation reactions. staggered conformation – Staggered conformation is the conformation that occurs when the dihedral angle between two atoms or groups of atoms is 60°. standard – A standard is a reference that is used to calibrate measurements, materials, and equipment. Standards can also mean the basic measure of quality in an action or behavior. standard hydrogen electrode – The standard hydrogen electrode is the standard measurement of electrode potential for the thermodynamic scale of redox potentials. The standard is determined by the potential of a platinum electrode in the redox half-reaction: 2 H+(aq) + 2 e– → H2(g) at 25 °C. The standard hydrogen electrode is often abbreviated SHE. standard oxidation potential – The standard reduction potential is the potential in volts generated by an oxidation half-reaction compared to the standard hydrogen electrode at 25 °C, 1 atm and a concentration of 1 M. Standard oxidation potentials are denoted by the variable E0. standard reduction potential – The standard reduction potential is the potential in volts generated by a reduction half-reaction compared to the standard hydrogen electrode at 25 °C, 1 atm and a concentration of 1 M. Standard reduction potentials are denoted by the variable E0. standard solution – Any solution which has a precisely known concentration. Similarly, a solution of known concentration has been standardized. standard temperature and pressure – Standard temperature and pressure correspond to 273 K (0° Celsius) and 1 atm pressure. Standard temperature and pressure is often shortened to the abbreviation STP. STP is often used for measuring gas density and volume. stannum – Stannum is the Latin name for the element tin. Stannum is the source of tin’s element symbol Sn. starch – Starch is a polysaccharide used by plants for energy storage. Starch consists of glucose molecules chained together by glycosidic bonds with the chemical formula (C6H10O5)n.
state of matter – State of matter is one of the ways in which matter can interact with itself to form a homogeneous phase. steam – Steam is the gaseous phase of water. steam distillation – Steam distillation is a separation process used to purify or isolate temperature sensitive materials, like natural aromatic compounds. Steam or water is added to the distillation apparatus, lowering the boiling points of the compounds. The goal is to heat and separate the components at temperatures below their decomposition point. steel – Steel is an alloy of iron that contains carbon. Typically the carbon content ranges from 0.002% and 2.1% by weight. Carbon makes steel harder than pure iron. The carbon atoms make it more difficult for dislocations in the iron crystal lattice to slide past each other. There are many different types of steel. Steel contains additional elements, either as impurities or added to confer desirable properties. Most steel contains manganese, phosphorus, sulfur, silicon, and trace amounts of aluminum, oxygen, and nitrogen. Intentionally addition of nickel, chromium, manganese, titanium, molybdenum, boron, niobium and other metals influence the hardness, ductility, strength, and other properties of steel. stere – A stere is a unit of volume equivalent to one cubic meter. The stere was an early metric unit and not a part of the SI units of measurement. stereochemistry – Stereochemistry is the study of the chemistry involved in the relative spatial arrangement of atoms and molecules. stereoisomer – Stereoisomers are isomer molecules that have the same molecular formula and bonds, but differ by their three-dimensional orientation. Example: L-leucine and D-leucine are stereoisomers of each other. steric number – Steric number is the number of atoms bonded to a central atom of a molecule plus the number of lone pairs attached to the central atom. The steric number of a molecule is used in VSEPR theory to determine the molecular geometry of a molecule. sterling silver – Stirling silver is a silver alloy containing 92.5% pure silver and 7.5% other metal, usually copper. steroid – A steroid is a terpenoid lipid that is characterized by having a carbon skeleton formed from four fused rings. The rings typically are arranged in a 6-6-6-5 manner. Steroids are distinguished from each other based on the functional groups that are attached to the rings. sterol – Sterol is a combination of steroid and alcohol. Sterols are lipids with a hydroxyl group at the 3- position on the A-ring. Example: Cholesterol is a sterol. stibium – Stibium was the 18th-Century name for the element antimony. Stibium is the origin of antimony’s element symbol Sb. stiffness – Stiffness is the ratio of the force required to create a specified deflection or movement of a part. Stiffness is Force/deflection, which is expressed in lbs/in or grams/cm. stock solution – A stock solution is a concentrated solution that will be diluted to some lower concentrated for actual use. Stock solutions are used to save preparation time, conserve materials, reduce storage space, and improve the accuracy with which working solutions are prepared. stoichiometry – Stoichiometry is the study of the relationships or ratios between two or more substances undergoing a physical or chemical change (chemical reaction). STP – STP is an acronym for Standard Temperature and Pressure. See the definition above. strain – Strain is the ratio of the change in length of a material to the initial unstressed reference length after a deforming force is applied to the material. strong acid – A strong acid is an acid that is completely dissociated in an aqueous solution. strong base – A strong base is a base that is completely dissociated in an aqueous solution. strong electrolyte – A strong electrolyte is an electrolyte that completely dissociates in solution. The solution will contain only ions and no molecules of the electrolyte. Strong electrolytes are good conductors of electricity. strontium – Strontium is the name for the alkaline earth element with atomic number 38 and is represented by the symbol Sr.
subatomic – Subatomic refers to anything smaller than an atom. Examples: Electrons, protons, and neutrons are all subatomic particles. sublimation – Sublimation is the transition from the solid phase to the gas phase without passing through an intermediate liquid phase. This endothermic phase transition occurs at temperatures and pressures below the triple point. Example: Dry ice is solid carbon dioxide. At room temperature and pressure, it sublimates into carbon dioxide vapor. subshell – A subshell is a subdivision of electron shells separated by electron orbitals. Subshells are labeled s, p, d, and f in an electron configuration. Example: The first electron shell is the 1s subshell. The second shell of electrons contains the 2s and 2p subshells. substrate – A substrate is the medium in which a chemical reaction takes place or the reagent in a reaction that provides a surface for absorption. In biochemistry, an enzyme substrate is the substance the enzyme acts upon. Example: In the fermentation of yeast, the substrate the yeast acts upon is sugar to produce carbon dioxide. substituent – A substituent is an atom or functional group that replaces a hydrogen atom on a hydrocarbon. In chemical structures, generic substituents are denoted by a capital R. A capital X is used if the substituent is a halide. sugar – Sugar is a carbohydrate characterized by a sweet taste. Sugar is also commonly associated with the sucrose molecule C12H22O11. Example: The amino acid cysteine contains a sulfanyl group. sulfate – A sulfate is a compound containing the sulfate ion, SO42-. sulfide – A sulfide is an anion of sulfur with an oxidation state of -2 (S2-). sulfite – A sulfite is a compound containing the sulfite ion (SO32-). sulfur – Sulfur is the name for the nonmetal element with atomic number 16 and is represented by the symbol S.
superacid – A superacid is any acid which has an acidity greater than that of 100% pure sulfuric acid. Sulfuric acid has a Hammett acidity function (H0) of −12. Fluoroantimonic acid, the strongest superacid in the system, is 1016 times stronger than 100% sulfuric acid with an H0 as low as –28. James Bryant Conant coined the term superacid in 1927 to describe acids stronger than mineral acids. supercooling – Supercooling is the condition in which a liquid has been cooled to a temperature below that at which crystallization normally would occur, without the solid resulting. supercritical fluid – A supercritical fluid is a substance in a thermodynamic state where temperature and pressure are above the substance’s critical point. supernate – Supernate is the liquid which remains above the solid produced by a precipitation reaction. superoxide – A superoxide is an anion of dioxygen with formula O2–. Superoxide also refers to any compound containing the superoxide anion. supersaturated – Supersaturated refers to a solution that was cooled from a saturated solution at a higher temperature without the solute precipitating out. The resulting solution will have a concentration higher than the normal saturation point at the cooler temperature. surface tension – Surface tension is a physical property equal to the amount of force per unit area necessary to expand the surface of a liquid. Surface tension forces are due to intermolecular forces between the liquid’s molecules at the liquid’s outer boundaries. surfactant – Surfactant is the word that combines the terms “surface active agent”. Chemical species that acts as wetting agents to lower the surface tension of a liquid and allow for increased spreadability. This can be at a liquid-liquid interface or a liquid-gas interface. Example: The coating on the surface of the alveoli in the lungs is a surfactant. suspension – A suspension is a heterogeneous mixture of a fluid and solid particles. The difference between a suspension and a colloid is the solid particles in a suspension will settle out over time. symproportionation – Symproportionation is a chemical reaction between two reactants containing the same elements but different oxidation numbers to form a product. Symproportionation is the reverse reaction of a disproportionation reaction. syn addition – Syn addition is an addition reaction that adds two substituents to the same sides of a double or triple bond such that the bond order of the bond decreases but the number of substituents increases. syn-periplanar conformation – Syn-periplanar refers to a periplanar conformation where the dihedral angle between two atoms or groups of atoms is between 0° and ±30°. synthesis reaction – A synthesis reaction or direct combination reaction is one of the most common types of chemical reactions. In a synthesis reaction, two or more chemical species combine to form a more complex product. The general form of a synthesis reaction is A + B → AB. System Internationale – System International or SI is the standard metric system of units.